When you login to your Facebook profile, you’ll see your Facebook news feed, filled with a different types of content such as website links, photos, videos and more. What most users don’t know though is that everything you interact with on Facebook does not show up in your news feed. Instead, this is controlled by something called Facebook EdgeRank. Edgerank is an algorithm used by Facebook to determine where and what posts appear on each individual user’s news feed in order to give users relevant and wanted content. What this means is that just because you are friends with someone on Facebook or you have liked a specific Facebook Page, their posts don’t always show up in your news feed. Most recent content is content that is posted in chronological order. Top news is content based on Facebook’s algorithm — called EdgeRank. Note: Unfortunately, “top news” is what all Facebook profiles default to, meaning you only see users content based on EdgeRank and not what was posted most recently. 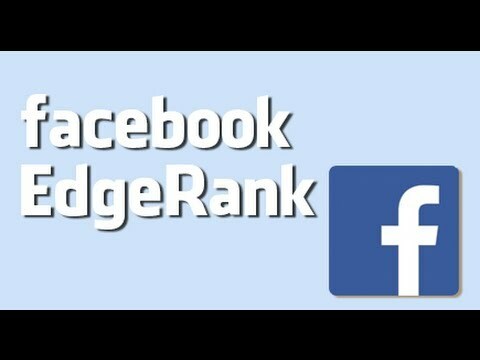 This video talks about Facebook EdgeRank and the areas that the algorithm measures to determine your EdgeRank. The good news: Facebook EdgeRank is a great formula – provided you interact with the people and pages you are connected with on Facebook. The bad news: If you’re a business who is looking to engage more with fans and you don’t yet have an active fan base, you’ll have a lot less eyeballs on your content when you first get started. This means you’ll need to work a lot harder and be more selective on what you post. Ideally, you’ll want to post content that is engaging, but at the same time, aligns with your business goals. As a result, posting quotes and unrelated images should be off-limits. They will help alter your EdgeRank and improve your news feed positioning, but at the same time, they will give you a false sense of how engaged your fans really are with your business. Tell me, how do you feel about Facebook EdgeRank? Should you see all of your updates at one time, regardless of whether or not you interact with them very often? You can leave a comment by clicking here.